Henna art originated in India hundreds of years ago, and traditionally it is used to decorate a bride’s hands and feet for weddings or any other special occasion. Nowadays, Henna is used widely by many people, men and women alike. It is the perfect temporary method of tattooing. 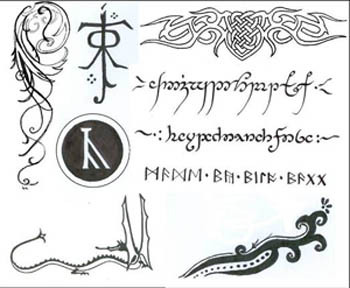 During the making of the Lord of the Rings trilogy, many interesting designs were created by the artists that can be used as templates for a Henna tattoo. Here are some designs which I sketched out. You can print them out and enlarge or reduce them to any size you want. The one on the top left was a design for Arwen’s quiver, which did not make it to the movies. The Celtic design next to it is very similar to Celeborn’s necklace and belt. At the bottom, we have a cute little drawing of Smaug and next to it another interesting pattern. They can be applied anywhere on the skin, though it is not a good idea to place it where a lot of friction occurs, e.g. your inner arm or the side of your shoulder where the straps of your bag will rub against. 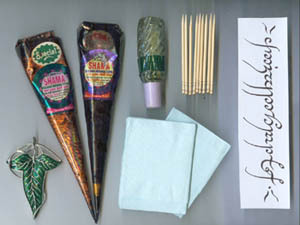 Henna can be purchased in a cone. It is a brown paste which is squeezed out from the tip of the cone. A good well-made henna paste with a well-made cone will form thin even lines when applied with the right pressure. Henna which comes in a tube is usually not as good, as the consistency is uneven, air bubbles form all the time, and the hole of the nozzle is too wide. However, it is still useable. Practice squeezing the henna out on paper, by drawing straight lines, circles, zigzags and curves. This will help you to ‘feel’ the sort of pressure you need to produce even lines. Don’t worry if at your first time holding the cone, the henna paste comes out in unsteady, shaky lines. Practice will help you to overcome this. Henna can be very messy so please remember to protect the table surface with newspaper or paper. Always keep plenty of tissue at hand. 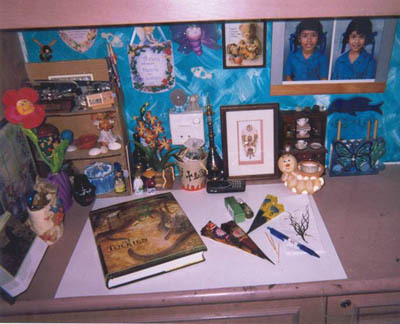 Henna stains materials very easily, so keep your belongings out of reach! Make sure you have plenty of space to move your arms. 1) A cone of Henna. Depending on where you live, different kinds of brands will be available, and you have to try out which one is the best. The perfect paste is medium brown in colour, and has a smooth, slightly stiff consistency, and should come easily out of the cone when enough pressure is applied. The brand I find best is Shama. 2) Mehendi oil. It has two purposes: To cleanse the area before application, and to help the paste to stain the skin properly. I don’t know what can substitute Mehendi oil, but alcohol used for first aid can be tried. For some brands of Henna, Mehendi oil is not required. Follow these steps to create your Henna tattoo. Make sure that you scrub the area of the skin the day before you apply the Henna. Using a loofah is a good idea. This is to remove dead skin cells, so that the Henna paste will stain the new skin cells, and will last longer. 1) Clean the arm with water. Using a cotton swab, wipe the skin lightly with Mehendi oil. 2) If you are uncertain with applying the henna onto the arm free-hand, draw lightly on the arm with a pen, then go over with the paste. 3) Hold the cone using your thumb to control the amount of paste that comes out. 4) Fill in the lines with the henna. Take your time here; try to make the lines flowing and continuous. If you make a mistake, use the toothpick to scrape away the bits of henna. If your lines come out crooked try inhaling and exhaling slowly as you draw a line. A steady had is required to do this. 5) When you are done, leave the paste to dry on the arm for as many hours as possible. The longer you leave it on, the darker the tattoo will be. 6) During the drying, do not touch the area. The paste will crack and bits of it will peel and fall off. You can fill in the blanks with some more paste, but this isn’t necessary unless you accidentally brushed off some of it before it was fully dried. 7) When you are ready to remove it, go to a sink or bin and using clean fingertips, brush the bits of dry henna off. Don’t be alarmed if the markings are faint, it takes about a day for the tattoo to turn a rich dark colour. It many appear orange when you first dust off the henna. At this stage, do not wash your arm. 8) The finished product. A day or two later, your tattoo will turn a dark brown colour. It will be more defined if you have fairer skin. Elvish can be used to create a bracelet around your wrist. Tie a piece of string around your wrist as a guideline, and go round the hand. Mastering the art of Henna may take some time. I have been practicing for many months, but my hand is far from steady yet. The brilliant thing about Henna is that no one need ever know how the original design is supposed to look like, so mistakes an be transformed into new designs. Add in your own lines and flourished, dots and curves, and have a whole load of fun! Below here is an example of a design you can get from the Lord of the Rings. Borrow books on Henna from the Library, or buy some from a bookstore. Celtic designs are suitable for Henna too. Your Lord of the Rings movie guides and art guides can provide many ideas, and even more will pop into your head as you flip through them. Explore Middle Earth through Henna! This sounds like a very good idea! I wil definatly try it.